Our design ensures your lunch is kept the right temperature, either warm or cool, and and not lost. Available in six colors, with black detailing, you can choose an image of your child and their best friends, or even a picture of their favorite cartoon character. Size: 11" x 8.5" x 3.5"
Keep your kid's lunch cool with our personalized insulated lunch bag. Customized with your own photos, artwork and text, our insulated lunch bags will make sure your lunch is kept fresh and at the perfect temperature for hours on end. Each lunch bag is specialized and made to order and is large enough to fit a water bottle, plus plenty of food. The interior also includes an elastic strap to keep delicate items in place - forget about crushed sandwiches or bruised bananas. Fully lined and water-resistant, our custom insulated lunch bag serves as a practical and personal item for the back to school season. Our insulated lunch bags are made with quality colored canvas, a double slider zip, and HD satin for optimal image reproduction. The top includes a comfortable handle to suit both adults and children. Each lunch bag is also fully lined with water resistant material and insulated to keep your lunch cool or warm. Our bags are made to order at our facility, and ready in a matter of days. The bag's zipper, piping, and handle are all in black for a bold and bright design that is brilliant for children. About 6 days before my daughter started kindergarten I came across this company and thought how delighted my daughter would be to see a picture of her puppy when she got her lunch out at school. The product itself is made so well and the customer service is fantastic. I emailed them to ask if there was any way my daughter would have the lunchbag to help with her first day of school and the product was delivered 4 days before school started and we live in Canada so they just have made it right away and sent it immediately. I was thrilled and the lunchbag was a big hit with my daughter! She absolutely loves it! I was most pleased with the lunch bag. The pictures were clearly printed and the bag was of excellent quality. I was most amazed at the speed of delivery. When I realized that I was ordering from a British company, I expected to have to wait several weeks to receive the lunch bag. That it arrived within 6 days of order, well that was amazing!!!! I highly recommend your company and the your product. The print quality is amazing, bag is sturdy and will hold up well. The only nit pick thing is that there is a seam on one side that won't go totally flat, it "billows" slightly. It's a tiny negative considering the quality of the bags and the images came out so great. The bag itself is sturdy like the usual lunch boxes I get my kids each year and that I can wash out completely. These also have elastic bands inside to hold containers which was a nice bonus! The bag was absolutely beautiful!! I was really surprised with the quality of the bag!! Fast shipping as well!! What Will My Personalized Photo Lunch Bag Actually Look Like? Look forward to your lunchtime even more with the personalized lunch bag that is fully insulated to keep your salad cold or your leftovers warm. The interior is 100% waterproof and features an elasticated strap to hold your food and/or drink together, so you can say goodbye to squashed, soggy sandwiches. 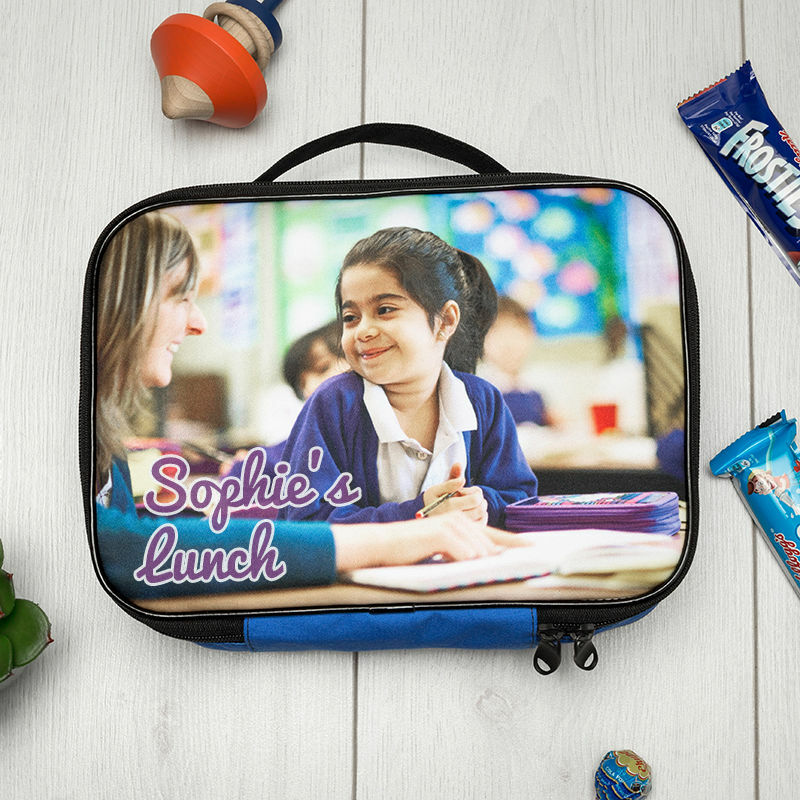 Your images are printed onto HD satin, giving the photo lunch bag a vivid, glossy finish. Ideal for both children and adults, our custom insulated bags are big enough to easily pack a big lunch with space for your drink and snacks. Whether you're buying for yourself, or for your family, you can create your own personalized lunch bags using family photos, pets and even add text or names. Featuring your photos or design on HD Monroe satin, these fun lunch bags are stylish and eye-catching. Who Would Appreciate the Personalized Lunch Bag? Anybody who loves to lunch! Make your husband’s day at work even better by giving them this personalized lunch bag for adults as a unique gift, printed with a special photo of the two of you. Or make him laugh when you’re not even in the room by printing out his favorite jokes – his lunch break will never be boring again. Perfect for kids, personalized lunch bags are a fun way to help reduce little squabbles between school friends around which lunch bag belongs to who. They’re also great to help encourage fussy eaters, giving them a new reason to be excited about lunch. Personalized lunch bags are all custom made to order, printing your photos or design onto long-lasting satin fabric and then hand cutting and hand stitching together. Our team of expert fabric professionals work hard to ensure the satin edges are closed to prevent fraying and that your customized lunch bag is finished to the highest of standards. There’s smart piping detail around the front edges that reflect the light and add class to the personalized lunch bag, so just make sure that this compliments your chosen photos or design. Add your name on top of the photo to give you peace of mind that your co-workers won’t try their luck in getting a free dinner! Many kids will have the same style or brand of lunchbox featuring their favorite movie characters or pop group, so personalize your children’s lunch bags to make it easy to spot amongst other colorful bags. Choose a treasured family photo, or mix it up with a funky photo collage if you’re torn on how to customize the photo lunch bag. To get mouths watering, print photos of all your favorite foods onto the front and back of this stylish insulated lunch bag – even if what’s inside your personalized lunch bag is a little basic, at least you’ll have the images to drool over! Personalized pencil cases made with soft material that'll keep all your goodies in one place.